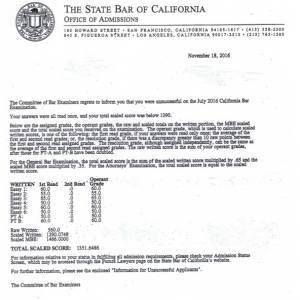 Scan or take a picture of your score sheet returned to you from the State Bar of California, Office of Admissions and e-mail it to me. Then, call me at 310.451.0519 for your free score consultation and review. We are Experts on Helping You Pass the California Bar! Passing the California Bar Exam isn’t about who is the smartest or even who will make the best attorney. It’s about making the California Bar grader’s job easy, and giving them what they are asking for. We give you what they need to see so they can give you the points you need to pass. California Bar Results NEWS: The California Bar is proposing lowering the score needed to pass the California Bar Exam from 1440 to 1414 beginning with the February, 2018 CA Bar Exam, retroactive to CA bar takers for July 2017. However, the CA Bar Exam graders are not changing how they grade. So send in your scores for a free consultation. Additional information can be found @calbar.ca.gov regarding updates and latest news on what the passing score will be on the California Bar Exam. Everyone needs help — we mentor you to pass the California Bar.